The San Diego Opera (SDO) presented “Pretty in Pink” on Feb. 8 with a glamorous fashion show featuring the designs of Dame Zandra Rhodes. Held at the Del Mar home of Veronica and Miguel Leff, attire for the afternoon event was comfortably chic with a touch of punk, and took place around the pool with breathtaking views. The SDO Special Events Director Darin Dietz and San Diego Opera Ball “Pretty in Pink” Chair Sherry Ahern were there to greet the guests. The fashion show showcased 30 couture gowns ready for purchase and to wear at the upcoming Opera Ball. On April 7, the 2018 “Pretty in Pink” Opera Ball begins at 6:30 p.m. at The US Grant Hotel. The event will honor Rhodes. “Turandot” by Puccini, will be the next opera (previously held Feb. 24, Feb. 27 and March 2) on March 4. It is based on an ancient Chinese fable and some say that Puccini left the best for last. For tickets to both events, check out sdopera.org. 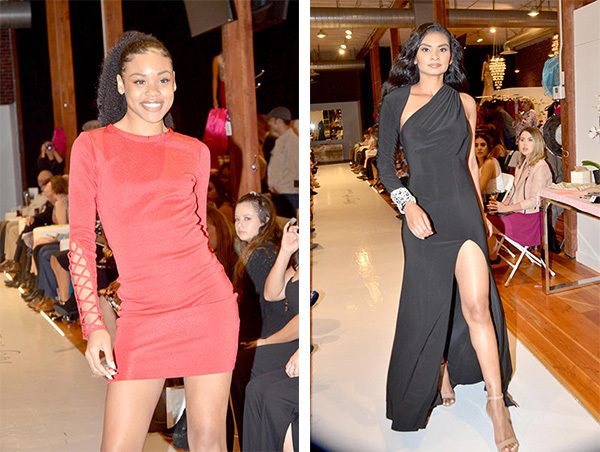 McKenzie Rae Dresses presented a Valentine’s fashion show on Feb. 9, held Downtown at its store on G Street, featuring designs by Mac Duggal. Free gift bags were given out to the first 20 guests. Prizes donated by Gaslamp Quarter merchants were handed out such as a Valentine’s date night giveaway that included a free dress. Guests mixed and mingled enjoying a Champagne social. McKenzie Rae Dresses began the fashion show on a 50-foot permanent runway. The first half of the show presented cocktail dresses highlighting many red dresses in grand Valentine’s Day style. Designer short dresses and 2018 Mac Duggal prom dresses took over the second half of the show. Pageant Planet announced that they were the official pageant/prom retailer for the state of California. McKenzie Rae Dresses has a program that gives away free prom dresses. You can also enter a raffle to have your entire prom night paid for, including dress, dinner, flowers, limo, hair, makeup, airbrush tan, photo session, and a helicopter ride for you and three friends. If you would like to see these dresses up close, visit the store at 643 G St.
March 3 to June 26 | Fashion Redux: 90 Years of Fashion exhibition at the San Diego History Center in Balboa Park. Showcases local students from San Diego Mesa College with a fashion show on April 26 and lecture by Susan Lazear. For more information, visit sandiegohistory.org. March 1 | Open Hearts, Helping Hands: Enjoy this luncheon, awards and fashion show presented by Soroptimist International of San Diego from 10 a.m.–3 p.m. at the Sheraton Harbor Island Hotel Bay Tower. For more information, visit soroptimistinternationalofsandiego.og. March 24 | Fashion with a passion: Hosted by Fashion Institute of Design & Merchandising, located at 350 10th Ave., third floor. From 11 a.m. to 3:30 p.m. Benefits the Make-A-Wish Foundation. For tickets, visit bit.ly/2sDl3Qt. —Diana Cavagnaro is an internationally renowned couture milliner based in the Historic Gaslamp Quarter. Learn more about our hat designer, teacher and blogger at DianaCavagnaro.com.